Move over superheroes, tech nerds are the new thing! Edward Snowden has been called many things... patriot, traitor, whistle-blower, etc. Some feel what he did was necessary in order to keep our government in check, while others thought he did irrevocable damage to our national security. Regardless of your feelings, there is no doubt he is a brave and polarizing figure. Based on an award-winning documentary, Universal Studios and Director Oliver Stone (JFK) brought this compelling story to theaters in 2016, and now it is available on Blu-ray and DVD. Edward Snowden (Joseph Gordon-Levitt; Inception) came from a family of individuals who served their country and he wanted to do the same. However, he thought that dream was over when he was administratively discharged from the Marines due to injury. Showing an aptitude for computers, he instead went to work for the CIA in 2004 and then the NSA afterward. Uncomfortable with what he felt were unethical practices, he quit and left government. He returned after a time as a consultant working at a highly classified facility in Hawaii. He realized his work, including a computer program he was working on, was spying on everyone, not just known criminals and terrorists. Feeling a need to stop it, he illegally downloaded files, snuck them out of the facility in a Rubik's Cube, and left Hawaii. In June of 2013, he met with reporters from The Guardian in Japan and exposed the US government. Since then, he has been living in Russia with his girlfriend Lindsay Mills (Shailene Woodley; The Fault in Our Stars) under political asylum. Gordon-Levitt has a striking physical resemblance to Snowden, which lends a certain authenticity to the film and Woodley is a great choice to play the free-spirited photographer, Lindsay. The only other significant cast member is Rhys Ifans (The Amazing Spiderman) as Corbin O'Brian, a CIA training facilitator who took Edward under his wing. A cameo by Nicholas Cage (National Treasure) was also memorable. Unfortunately, Melissa Leo (Wayward Pines) and Zachary Quinto (Star Trek) played characters that had a lot of potential but ended up being more like throw-aways, which was disappointing. Unless you are a tech nerd and understand computer code, the majority of the film feels a little slow and boring. Stone tries to make it understandable for the most part, but, unless the subject matter interests you, it doesn't work. The last 20 or so minutes are the most exciting and interesting but, unfortunately, you have to sit through over an hour and a half of film to get to that point. The constant flip-flopping back and forth from the present to various points in Edward's past is also a little confusing. The 1080p high definition video has a 2.39:1 aspect ratio, which offers clear and crisp picture quality. The hues are often muted, yet, not muddy; however, the colors on the Rubik's Cube are bright and vibrant. The DTS-HD 5.1 audio is sharp, allowing the dialog to come across all the channels nicely. The Blu-ray has only three extras for the audience to enjoy. Besides deleted scenes, which don't add much content to the story, there is also a 41-minute panel discussion with Stone, Woodley and Gordon-Levitt and a 3-minute "behind the scenes" feature. While the latter two extras are somewhat interesting, they wouldn't make me go out to buy the Blu-ray, per se. The story of Snowden is intriguing and I think it would have been more interesting if it had been approached from a different angle. I would have enjoyed it more if it had gone into more of the "why" he did what he did and how it has affected him since, as opposed to the mechanics of how he went about obtaining the documents. I am obviously not the intended audience, though, as my computer programmer husband seemed to have enjoyed the film more. 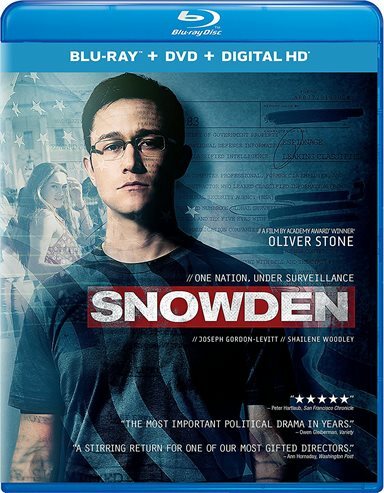 Download Snowden from the iTunes Store in Digial HD. For more information about Snowden visit the FlickDirect Movie Database.